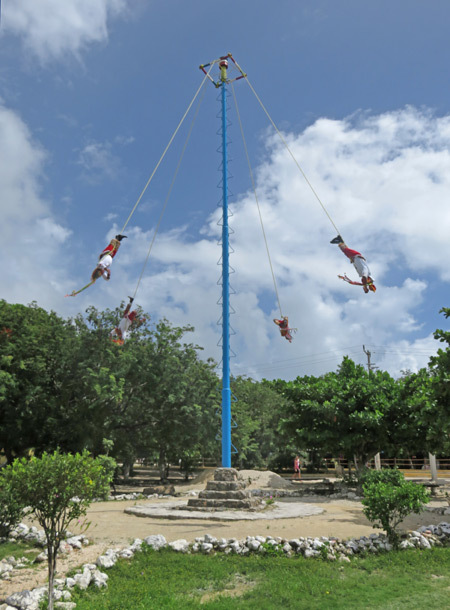 The Danza de los Voladores in Tulum, Mexico. I got an early start today, but not quite early enough to avoid the tourist hordes at the Tulum Ruins. Getting there was really easy. I just hopped on a shuttle van, said “Ruinas, por favor” to the driver and disembarked a couple of miles north of town. I’ll have to admit, when I first got out, I couldn’t figure out which way to turn. So, I just asked a local, who pointed me in the right direction. Maybe a quarter mile down the road, I spotted a little tourist village boasting a bunch of souvenir shops, restaurants, etc. where I saw a tram take off. So, I walked over there to wait for the next one. 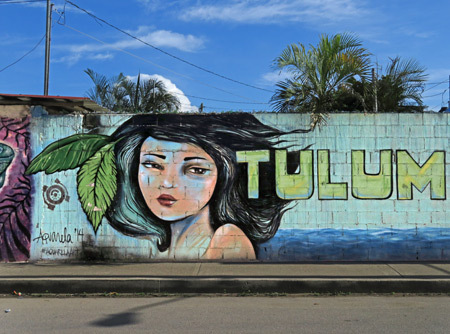 Welcome to Tulum Pueblo, Mexico. I had planned to go visit the Mayan temple ruins at Tulum today, but I got started too late. It was already 3:00 pm when someone informed me that they stop letting people enter the ruins at 4:30 pm. At that point, I thought I’d just find a place to rent a bicycle and go on a ride down by the beach. So, I schlepped way up the main road in the brutal heat and sunshine to Kelly’s. 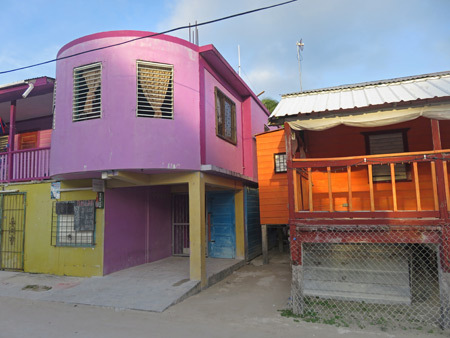 Purple daze and orange haze in Caye Caulker, Belize. Looking north up Playa Asuncion in Caye Caulker, Belize. 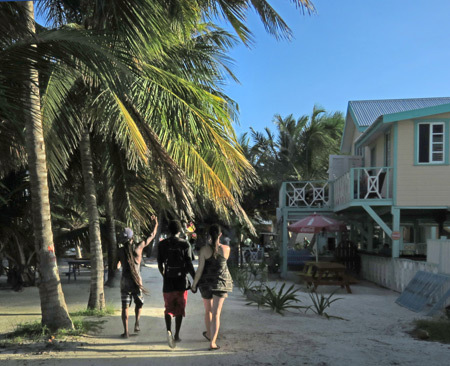 A trio roams free in Caye Caulker, Belize. 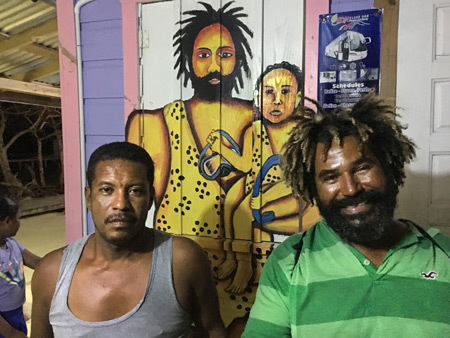 The Caveman (right) of Caveman Snorkeling Tours in Caye Caulker, Belize. This morning, I woke up at around 6:30 am to get ready to board a shuttle van heading for Caye Caulker, Belize at 8:00 am. At 7:12, I realized that the van was due at 7:00, not 8:00, so I really had to scramble to finish packing. As I was walking down the stairs, the front desk clerk was walking up to tell me the bus driver was outside. Whew! Perfect timing. So, I followed him down the street to the van, where I was stoked to get a front row seat with plenty of leg room, for once. After sitting for a short while, we took off with a few seats empty. 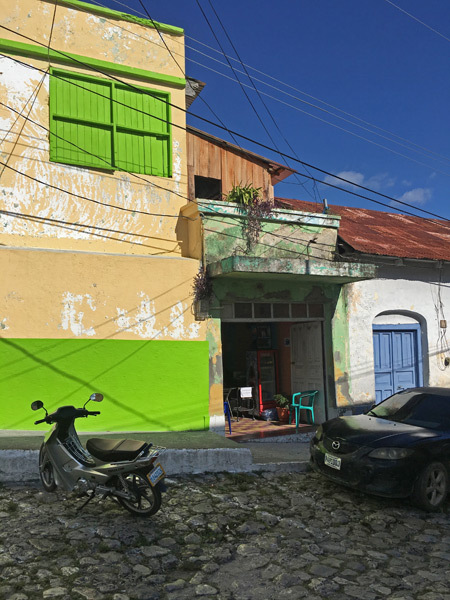 More colorful buildings in Flores, Guatemala. After four days in an air conditioned room, the heat rash on my legs had only cleared up a small amount. There’s no way I was about to spend five or six more days in Flores waiting for the rash to completely clear up. 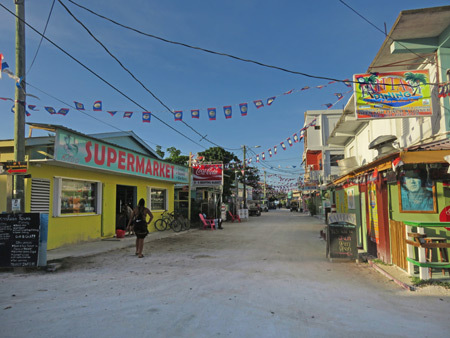 So, feeling exasperated, I walked over to the Green World Hostel and bought from the manager, Maria, a ticket for a bus to Caye Caulker in Belize, which was due to leave the following day at 8:00 am. Then I spent the rest of the evening frantically catching up on my blog posts. 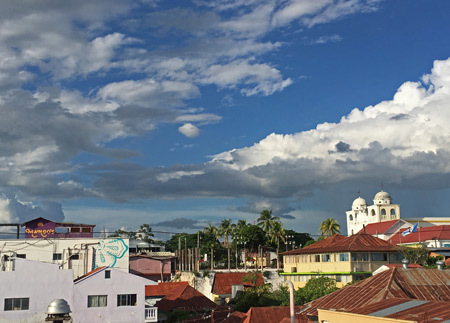 Flores, Guatemala, as seen looking north from the roof of the Hotel El Peregrino. Today, I pretty much hung out all day in the cool air of my room at the Hotel El Peregrino to hopefully get rid of an outbreak of heat rash, also known as miliaria or prickly heat, on my legs. I also worked hard on the mega post covering my trip to Tikal this past Tuesday. I only ventured downstairs a couple of times for food in the hotel’s restaurant. 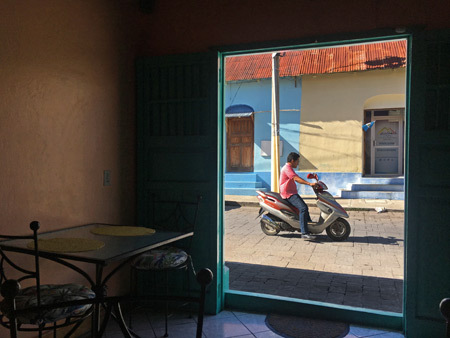 Looking out at the colorful streets from the quaint interior or Cafe Uka in Flores, Guatemala. 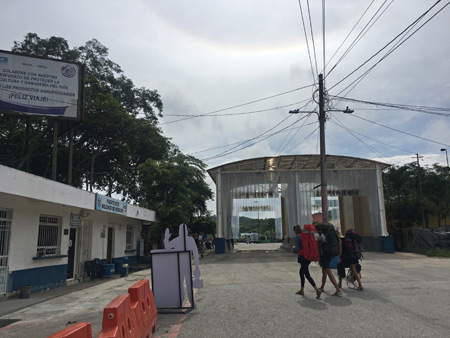 Today, I moved from the Poasada de la Jungla, which charges a hefty $27 per night for an air conditioned room with no “free” breakfast, to the Hotel El Peregrino, which only charges a more reasonable $21. The latter is a funky-looking but clean family-run place with three floors set around a square “courtyard.” I pretty much hung out all day in the cool air of my room to hopefully get rid of an outbreak of heat rash, also known as miliaria or prickly heat, on my legs. I also worked on the mega post covering my trip to Tikal this past Tuesday. I only ventured downstairs a couple of times for food in the hostel’s restaurant. You are currently browsing the Arcane Candy weblog archives for September, 2017.